Right outside of Charlotte, North Carolina, sits the Morning Glory Farm, an elegant and rustic wedding venue in the heart of the Monroe countryside. 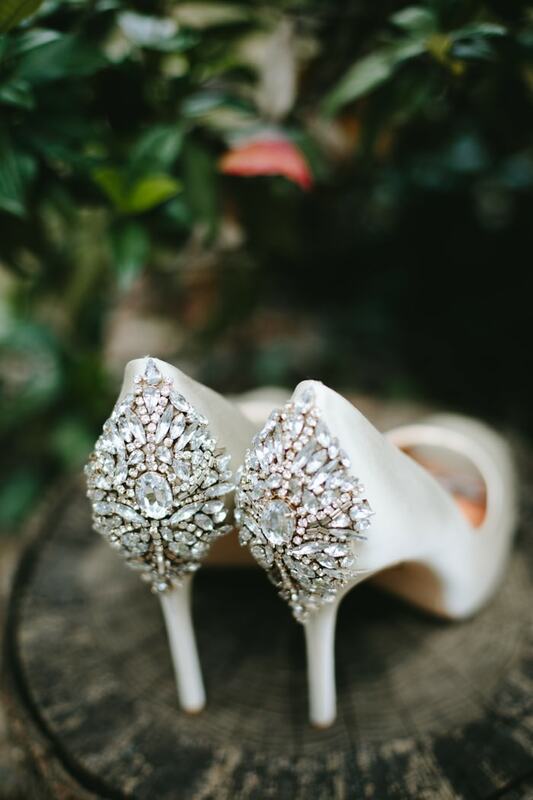 Megan and Tyler were married in an intimate ceremony replete with blush, peach, yellow, and champagne tones for a romantic, yet natural ambiance. The chic and elegant flair Megan hoped for was pulled off thanks to the creative planning talents of The Graceful Host. The invitation suite from The Graceful Host conveyed Megan’s love of organic and elegant style with a blush floral liner and craft paper envelope. Her bridal gown also inspired the lace belly band. Their ceremony took place next to the lake on the property. Megan entered through a set of white doors held together by a swag of greenery. Standing at the head of the altar was Tyler who, along with his groomsmen, wore a classic black tuxedo. He couldn’t help but wipe away tears at the sight of his bride. 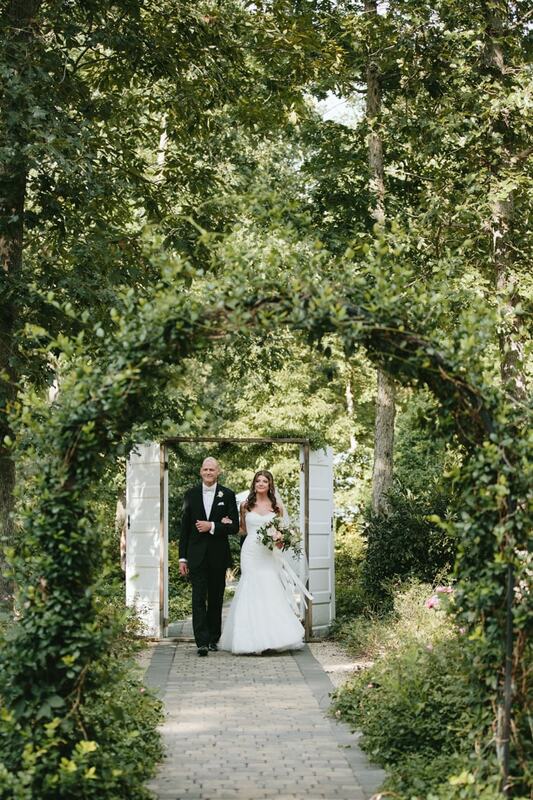 Megan and Tyler exchanged vows under an arbor dressed with an asymmetrical garland of smilax, accented with white zinnias, blush pink tulips and peach avalanche roses. All of the incredible floral arrangements were the creative stylings of New Creation Flower Company. Two adorable flower girls who wore floral crowns and white lace dresses did their part to bring the sweetness to the ceremony, as well. 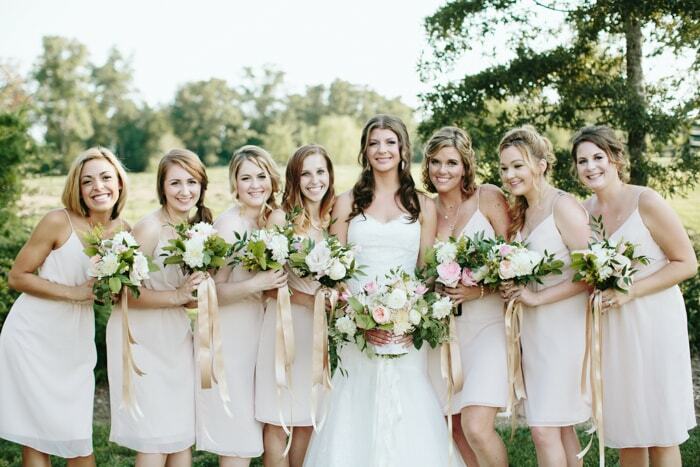 The bridesmaids wore comfortable and short blush pink Jim Hjelm dresses. 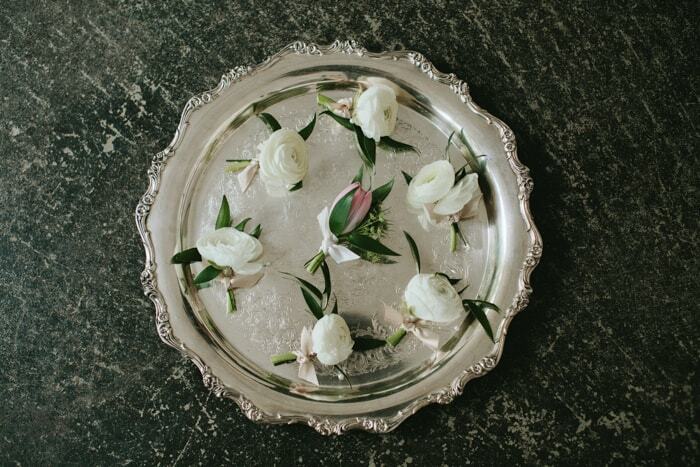 They carried small bouquets of white dahlias, Juliet garden roses, blush pink double tulips and quicksand roses, accented with Italian ruscus and coordinating greens hand-tied with trailing champagne ribbons. Megan’s bouquet was an asymmetrical collection of cafe au lait dahlias, quicksand roses, sweet pea, Juliet garden roses, blush pink double tulips, Queen Anne's lace and white ranunculus accented with Italian ruscus and coordinating greens, all hand-tied with white trailing ribbons. 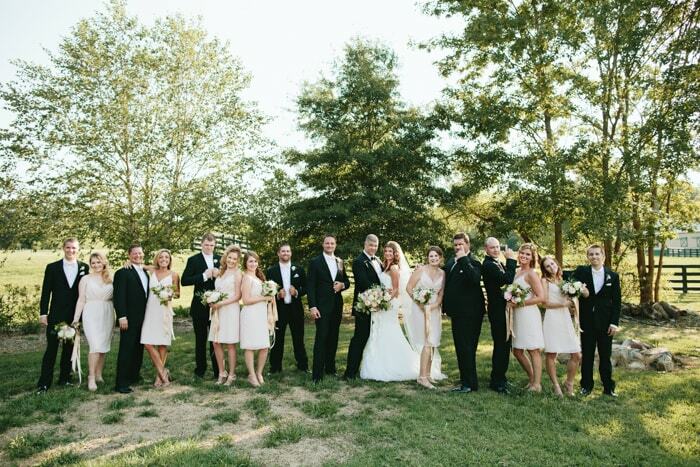 After photos with the bridal party, the couple had their own time in front of the lens of Alicia White Photography. As they strolled the ground, they found many beautiful corners ideal for picture-taking. Guests were greeted with handwritten signs courtesy of The Graceful Host, and an abundance of white and blush pink décor to convey the spirit of their celebration. 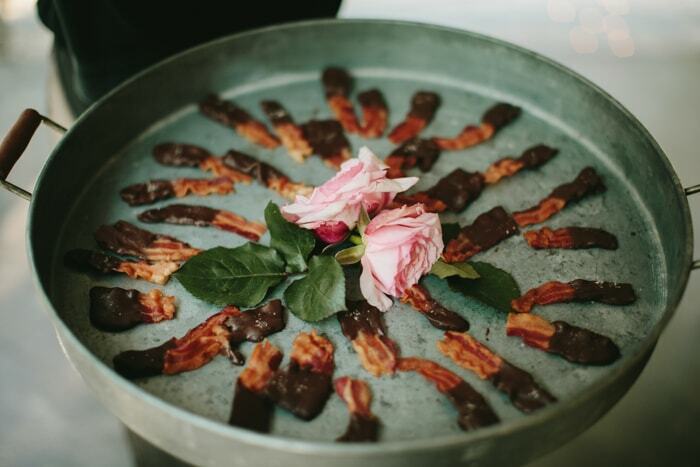 They were even treated to chocolate-dipped bacon courtesy of Something Classic, because why not? The couple dressed up the fountain area with lanterns in various sizes that, instead of pillar candles, featured single pink roses. The reception tent from Party Reflections was exquisite. The small lights around the frame and the chandeliers produced a romantic glow. The space underneath was beautified with runners made with greenery, tall pink and white taper candles, and assorted floral arrangements. 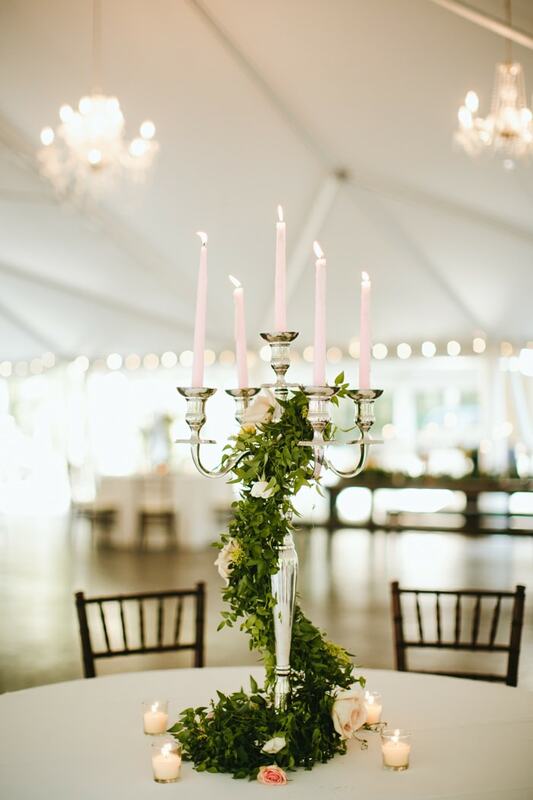 Round reception tables with blush linens placed around the dancefloor also featured beautiful candelabra centerpieces with spiraling greenery. Megan and Tyler’s chivari chairs were adorably reserved with wooden “Mr.” and “Mrs.” signs hung by pink ribbon. 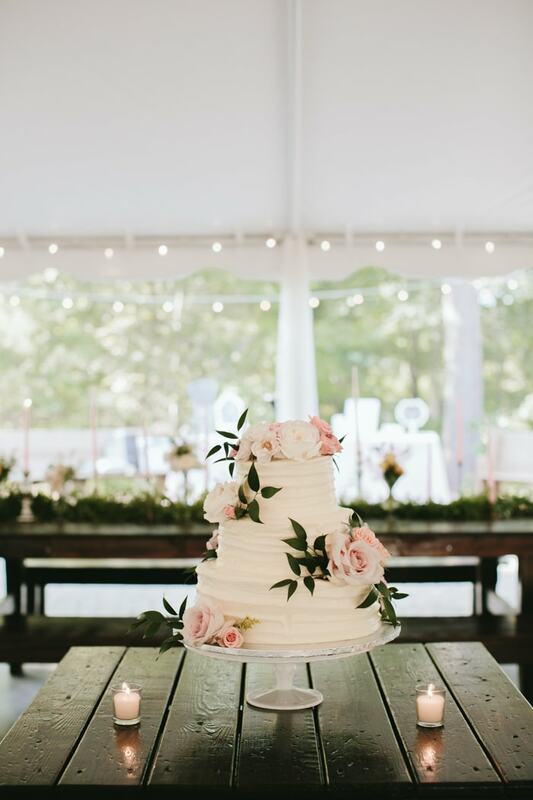 The cake, provided by Whole Foods Market in Charlotte, featured a simple buttercream design with eye-popping rose garnish on the sides and top. It sat on a glass cake stand atop a wooden table. 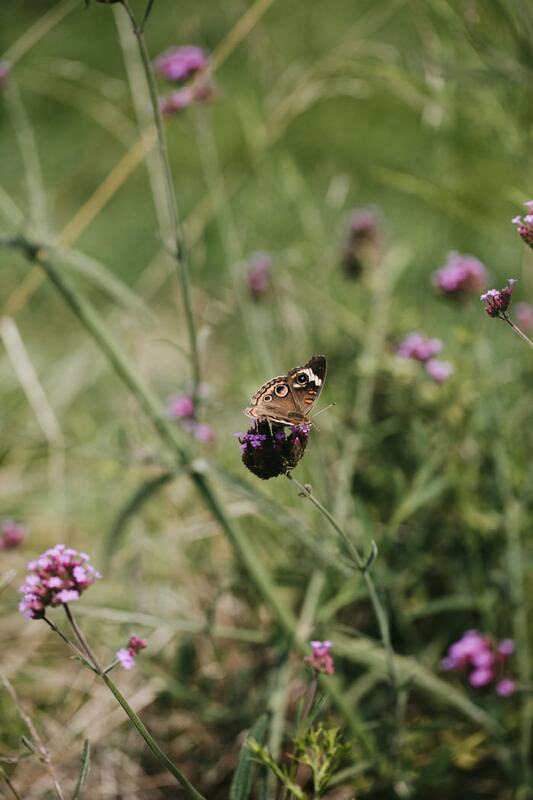 Morning Glory Farm was the perfect choice for Megan and Tyler’s summer wedding because they love the outdoors and wanted to combine natural beauty with their elegant vision. 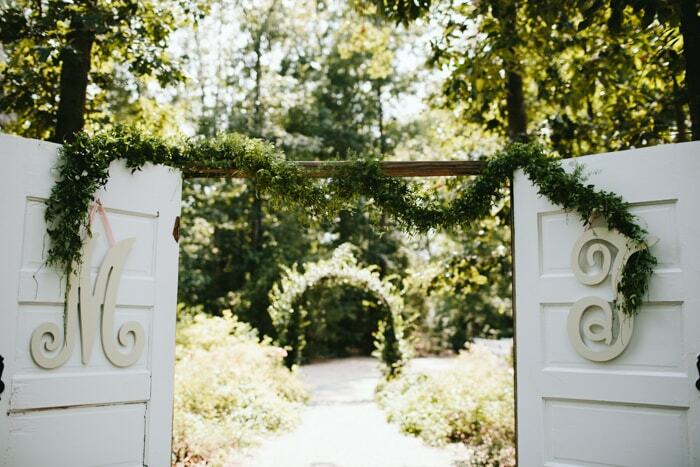 A couple with hopes of marrying outside would fare well gathering friends and family at this beautiful venue in the Carolina countryside.